"I have a black and white post card depicting an enclosed paddlewheel located at the stern of the boat with one smokestack located approximately in the center of the boat. It appears a type of ferry boat as it has people lining the deep bow. The second deck, much smaller, is adjacent to the pilot's house. I can make out letters (. . . ngton) on the side of the boat. Appreciate help in dating the card and deciphering type and name of boat. The postcard came from New England, USA.Please email." "Regarding the unknown Side_Wheeler, I am unwilling to make a 100% ID as the image on your site is a very poor quality. My memory is not so good as it was but fortunately the boat has a number of unusual characteristics which helped me. She appears to be the Mount Washington please see attached image. "The scan on Steamboats.com is very low resolution, a better resolution or digital photo of the P.C. would help to compare to the attached drawing against your postcard to make absolutely sure. It is more than likely that the Mt Washington is not a one off construction so as coincidences go there could be another boat of the same design with a name ending in "nton" as owners often used similar sounding names for their ships. Please note I have not asked permission to use the excellent scale drawing." 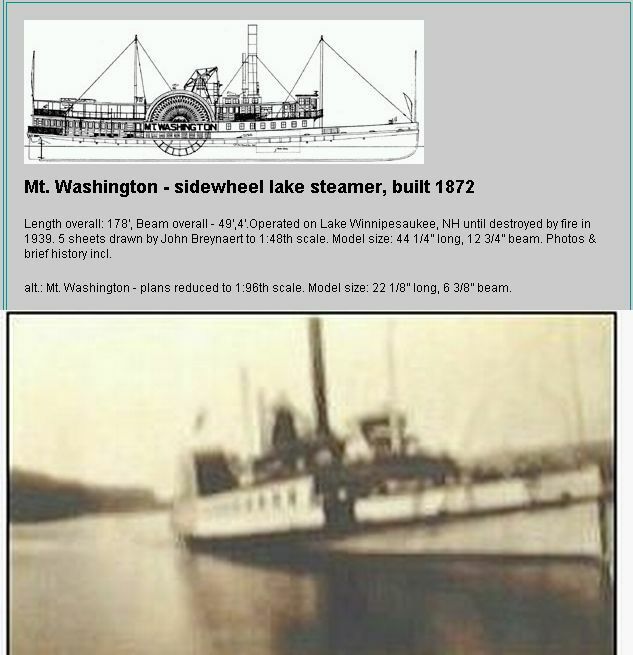 "Regards identifying the Mount Washington, plus the fact you mention you love steamboats I though to mention not only did she had a very long life but she actually had her original a walking beam engine, which seems to be the only example ever to have survived in to the photographic age. Sadly like so many before her she was destroyed by fire. A very interesting account of her life can be found here which I think you may enjoy reading. "I have been searching for years for actual photographs of walking beam engines in situ to no avail in fact I have only one photo of engines/engine rooms of the single cylinder engines which are almost unique to American Steamboats. Drawings and descriptions abound but both photos and working blue prints seem not to exist at least in the public sector."